Protein Hydrolysates Market to rise at a CAGR of 5.9% during 2018-2027. Transparency Market Research (TMR) offers market insights and current trends on the global protein hydrolysates market, in its upcoming report outlook titled, 'Protein hydrolysates Market: Global Industry Analysis 2013-2017 and Forecast 2018-2027'. In terms of value, the global protein hydrolysates market is estimated to account for a CAGR of 5.9% during the period of forecast, an orientation to various factors influencing the market, regarding which, TMR offers essential and accurate insights in detail. On the basis of product type, the plant protein hydrolysates segment is expected to be a prominent segment in the global protein hydrolysates market, with a significant CAGR accounting around 6.3% during the forecast period. The increasing consumer preference for plant-derived protein formulations over the animal-derived ones has fuelled the demand for plant protein hydrolysates in recent years. Besides growing health consciousness, consumer sentiments are also concerned about consuming food that is guilt-free so as to protect the environment. The increasing vegan population in Europe and North America has contributed to such expeditious growth of protein hydrolysates. The vegan food products have extended substantial traction in the market, and therefore, these consumers are preferring for more plant-based products, such as pea, soy, wheat, and other protein hydrolysates. Hence, plant-based protein hydrolysates gratify multiple consumer demands, such as vegan, gluten-free, and high-protein food products. This has contributed to the high compound annual growth rate of the plant protein hydrolysates segment. Due to increasing disposable income and higher per capita expenditure on functional food products and dietary supplements over the years have significantly contributed for the higher compound annual growth rate of protein hydrolysates market in the Asia Pacific region. The inflating number of gym enthusiasts and fitness lovers have shown increased interest in bodybuilding supplements such as protein hydrolysates in recent years. Thus in reference to the increasing number of health-conscious consumers, it is anticipated that the protein hydrolysates market in the Asia Pacific would register a higher CAGR of around 7.0% during the forecast period. Along with infant formulae, clinical nutrition, dietary supplements, and sports nutrition, protein hydrolysates also find remunerative applications in the food and beverage industries as a binding and texturing agent which is agglomerating demand among the major food and beverage processors all over the world. Protein hydrolysates are increasingly utilized in processing meat wherein, the protein hydrolysates enable the water-retaining capacity and furthermore to improve the succulence of meat. At present, phosphates are consumed widely to improve the juiciness of meat in the food processing industry, however, the growing consumer preference for clean label food products provides an opportunistic platform for the protein hydrolysates in the meat processing and is anticipated to substitute phosphates in the upcoming years. Protein hydrolysates are products which are sold directly to food manufacturers. Hence, suppliers play a very small role in this industry, and the relationship between the ingredients and food manufacturers is very important. With their technical expertise and knowledge and ability to develop specific products, key manufacturers have established strong relations with food manufacturers. Due to this reason, the supply and value chain is short and has led to stability in the market. The 'global protein hydrolysates market' report covers the present trends driving each section and offers appropriate evaluations, market insights, and factors relating to the potential development of the protein hydrolysates market in various regions. 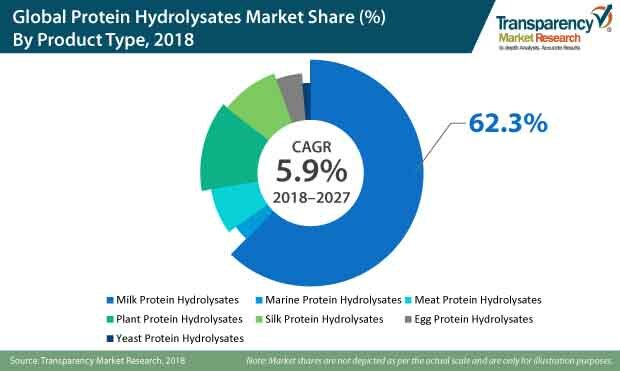 As per market attractiveness, the developing regions such as the Asia Pacific and Latin America are comparatively more attractive regions offering more opportunities for market participants in the global protein hydrolysates market. TMR has profiled some of the most prominent companies active in the global protein hydrolysates market such as Abbott Laboratories Koninklijke DSM N.V., Archer Daniels Midland Company, Tate & Lyle PLC, Nestle S.A., Arla Food Ingredients Group, Roquette Frères S.A., Glanbia Nutritionals, Inc., Cargill Inc., FrieslandCampina DMV B.V., Kerry Group Plc., Fonterra Co-Operative Group Ltd., Carberry Group Ltd., A.Costantino & C. S.P.A, Armor Proteines, Davisco Foods International Inc., Hilmar Ingredients and others, to provide a wider view of the market. Key manufacturers and other market participants in the global protein hydrolysates are focusing on product innovation and positioning, due to increasing health awareness among consumers, while understanding their nutritional and taste requirements and preferences. The major manufacturers of protein hydrolysates market are focused on increasing their market coverage globally and enhancing production capacity, due to the increasing demand for protein hydrolysates products over the years.